Skywatcher Adrian New captured this image of NASA's falling UARS satellite as it flew over San Antonio, Texas at 9:20 p.m. EDT on Friday, Sept. 23 (0120 Sept. 24 GMT). Skywatchers around the world were hoping for some unique views overnight Friday (Sept. 23), as a NASA satellite plunged to Earth on its final scorching journey through the atmosphere. The 6.5-ton Upper Atmosphere Research Satellite, or UARS, most likely pierced through Earth's atmospheric shield within 20 minutes of 12:16 a.m. EDT Saturday (0416 GMT), according to NASA officials. The agency is unable to confirm the precise time and location of the satellite's re-entry, but orbital debris scientists said that the satellite would have been flying over the vast Pacific Ocean at the time, well away from the North American coastline. Other photos and videos allegedly depicting UARS as it plummeted to Earth were quickly circulated on the Internet, but some originated from parts of the world that were not along the satellite's orbital track at the time. The ground track of NASA's UARS re-entry shows where the defunct satellite was passing over just before it fell to Earth. The circle presents the most likely point of landing, which probably occured around 12:16 a.m. EDT (0416 GMT) on Sept. 24. 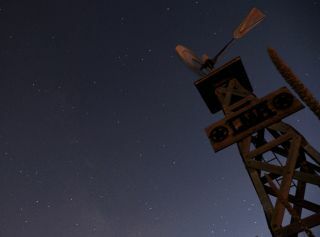 After the UARS satellite fell, SPACE.com was flooded with emails from people claiming to have seen the spacecraft's descent or to report potential debris sightings, but agency officials said these cases are unlikely. "Most of the time we do rely heavily on people on the ground," Nick Johnson, chief orbital debris scientist at NASA's Johnson Space Center in Houston, told reporters in a news briefing Saturday (Sept. 24). "UARS, whether it came in during the local day or local night, would have clearly been visible." Johnson said there were some people along the western coast of North America that were hoping to capture views of the dying satellite. Since the agency did not receive any plausible reports, this would further suggest that UARS did, in fact, splash down in the ocean without ever reaching North America. "If we continue to have a lack of reports of seeing something that looks like a re-entering UARS, that would give further credence to the fact that its probably over water," Johnson said. "We're going to continue to keep our eyes and ears open and if we receive reports like that we'll try to go verify." But, even before UARS broke up, some folks reported being able to catch views of the satellite as it streaked across the sky during its final orbits of the Earth. A close-up photograph taken by skywatcher Adrian New as the satellite passed over San Antonio, Texas at 9:20 p.m. EDT on Friday, Sept. 23 (0120 Sept. 24 GMT). Adrian New saw the doomed satellite make a quick pass over San Antonio, Texas at 9:20 p.m. EDT on Friday (0120 Sept. 24 GMT). The bright satellite is visible in New's photograph with a faint, thin trail of light against the dark, star-studded background. "It was not at all bright and for a brief moment it flared before it faded from view," New told SPACE.com. During that time, he was able to capture one exposure of UARS in the sky. One couple in Florida also claimed to have been able to catch a glimpse of UARS at around 7:50 p.m. EDT (2350 GMT) as it circled the Earth, losing altitude with each pass. "It was very bright and traveling at a greater speed then any of the other [satellites] that I have observed," Marxo said in an email. "I feel as if I have observed a part of history that I can tell the grandkids about someday." Later in the evening, at around 10:50 p.m. EDT (0250 Sept. 24 GMT), William Rhinehart of Riverside, Calif., also claimed to have seen UARS fly across the sky. "I just had visual contact with UARS as it flew overhead," Rhinehart told SPACE.com in an email. "It was flashing its reflection as it tumbled. It was easily seen by my naked eye." Astrophotographer Ralf Vandebergh captured the UARS spacecraft tumbling through space, and noted: "Through the clouds I was able to grab just enough frames for an image of UARS on Sept 17, in the week before the expected reentry. Note the striking yellow (golden) color of the elongated main body and some smaller detail with different colors. Due to the shift, (maximum 62 degrees altitude), the distance was still over 270 km." Astrophotographer Ralf Vandebergh captured the UARS spacecraft from the Netherlands as it tumbled through space a week before its final descent. Vandebergh's photograph offers a striking view of the doomed spacecraft. "Through the clouds I was able to grab just enough frames for an image of UARS on Sept. 17, in the week before the expected reentry," Vandebergh told SPACE.com in an email. "Note the striking yellow (golden) color of the elongated main body and some smaller detail with different colors. Due to the shift, (maximum 62 degrees altitude), the distance was still over 270 km."